A few weeks ago, a regular client of ours (who usually sticks to contemporary photography) surprised us by bringing in a work on paper that had hung in his parents’ home throughout his life. I knew right away that it was an original Karel Appel piece and that it should not remain in the discolored, non-archival, paper mat that was so commonly used in the 1960’s. 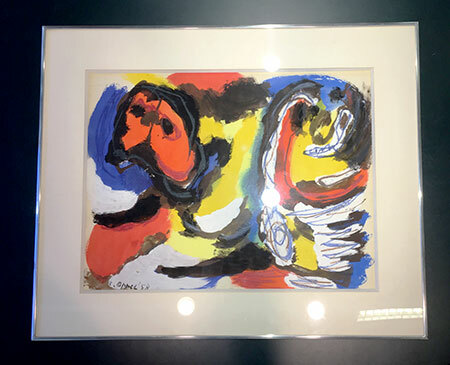 Before photo: Karel Appel “Two Figures”, as it was brought into us for re-framing. Fortunately, there was virtually no discoloration or damage to the piece from this treatment. My client was content to start from scratch with re-framing, so I began to extract the it from its original welded aluminum frame. I turned the piece over to unscrew the strainer and glanced at a gallery label I knew was significant provenance. There was another sticker, though, with no familiar words on it and I told the client I would Google it to see if it was at all relevant. One of the words that was on the second label was also embossed on the edge of the frame, but I wasn’t sure what it meant or if it was perhaps a previous owner? The aluminum screws from the strainer were tossed in the trash, and the old wooden strainer frame was set aside as I continued my de-fitting process. After safely removing the work from its mat and frame, we proceeded with the design process, settling on one of our handmade profiles with a white gold leaf accent, and afterwards designing frames for two other large pieces we had picked up from his home earlier that week. Branding embossed into the side of the welded aluminum frame. 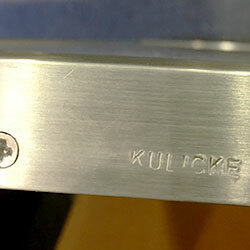 The Kulicke label on the original backing. 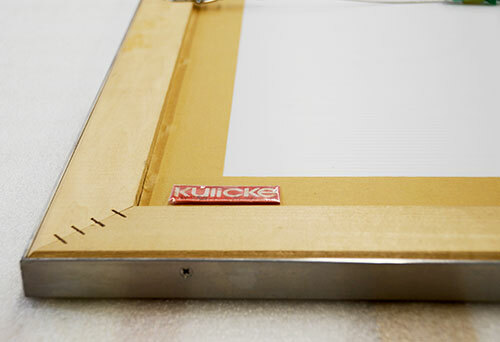 a master painter, gilder and frame maker from the mid-century. Among other achievements, he pioneered the welded aluminum frame, a type of frame we manufacture many different styles of here in Cambridge. I showed Mark the frame destined for the trash which he then identified as a Kulicke frame from the brand embossed on the side. He suggested I notify the client because it was practically a collector’s item in the framing world and potentially of value. “You ought to let him know what he’s got here,” Mark advised. 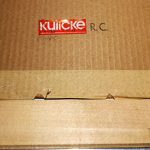 I fact checked and did some research online, and began to recognize the tremendous impact that Robert Kulicke has had on the history of the contemporary picture frame industry. I immediately went to retrieve the original 1” aluminum screws from the almost empty trash and was relieved to find all 10 of them, as aluminum screws aren’t something we use. With all the parts of the frame in hand, I emailed our client some links to what I had found, and described my conversation with Mark. A veteran of the industry, I credited Mark as our resident frame historian and, of course, local master of the handmade picture frame craft. Within an hour, our client called back with gratitude for the research and information. 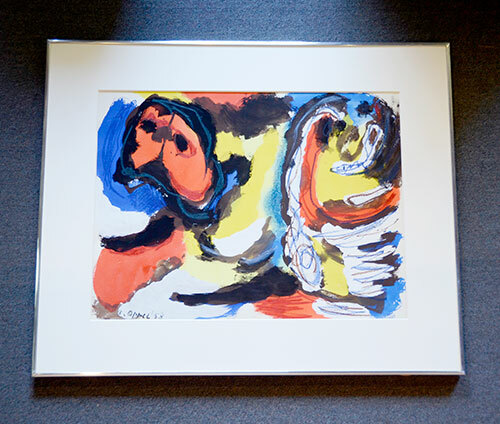 After: Karel Appel “Two Figures” re-matted, re-glazed in its original Kulicke welded Aluminum frame. There were no structural or functional flaws to the frame itself, and the art could maintain its historical context if it continued its life in this Kulicke frame – only updated with fresh, Museum quality matting and backing, and re-glazed with Museum Optium Acrylic. I confirmed that this is exactly what I would do if this piece were part of my family history. 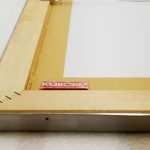 We discussed the options and ultimately decided to re-use the original frame and update it with the new matting and glazing choices. 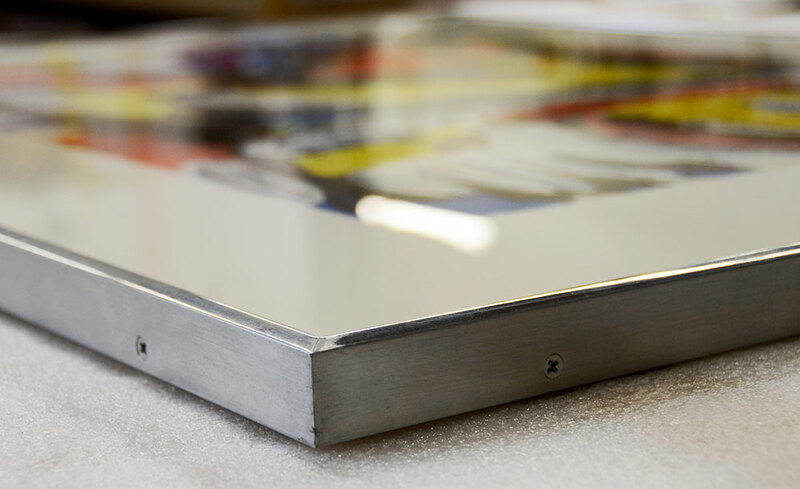 More important than the sale of a gold leaf frame, we helped preserve a link between a historically significant artist and a historically significant frame. It will hang in his home for years to come, and it is now preserved within the original frame for future generations to enjoy. We saved the original label and wrapped it in mylar to be put on the new archival Coroplast backing.